Cardassians are tall. powerfully-built brown skinned humanoids with thick cord-like neck muscles. deep set eyes. and prominent brow ridges that form an inverted teardrop shape. The planet Cardassia. home to the Cardassians. underwent a food shortage approximately 200 years ago. that forced military forces to take control of the government. Since that time. Cardassia has become a highly militaristic civilization. On Cardassian there is almost no crime and no one goes hungry. Every crime committed is solved, and the criminal is punished appropriately. Outsiders regard Cardassian justice as somewhat severe or extreme, and there are indications that innocent civilians are often convicted of crimes they did not commit so that the government can maintain this incredible record. Strangely, one of the most important parts of Cardassian life. though, revolves around family. Cardassians live in extended families, composed of several generations of family. Cardassian males are expected to support their family. and Cardassians who lose face and position often risk losing their family as well. Cardassians occupied the planet Bajor for a period of roughly forty years, ending their occupation and turning over their space station outpost to the United Federation of Planets immediately prior to the discovery of a stable wormhole between the Alpha and Gamma Quadrants of the galaxy. They have regretted this move ever since. The intelligence arm of the Cardassian government was once known as the Obsidian Order. The Obsidian Order secretly made alliances with their Romulan counterpart, the Tal Shiar, to attack Dominion space and wipe out the Dominion leadership. known as the Founders. The attack failed completely and the attacking forces were wiped out. It was revealed that at least some of the Tal Shiar agents leading the attack were actually Changeling spies. With the fall of the Obsidian Order. civil war erupted in the Cardassian Empire. causing the government to fall into the hands of civilian leaders known as the Detopa Council. Paranoia regarding secret Dominion activity in the Alpha Quadrant lead the Klingon government to suspect that the new Cardassian government was being led by Changeling infiltrators from the Dominion. The Klingons attacked Cardassia, but only succeeded in temporarily extending their borders into Cardassian space. After the Dominion began to extend its military arm into the Alpha Quadrant, the Cardassian government -now led by Gul Dukat-signed an agreement with the Dominion, becoming the first official member of the Dominion in this area of space. Dominion and Cardassian forces attacked the Bajoran space station guarding the wormhole between the two quadrants and regained control temporarily. Cardassians have thick. scaly skin that give them a +2 bonus on STR rolls against physical damage. 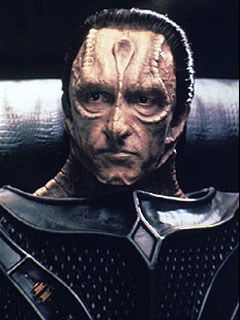 Cardassians soldiers are often strong willed and stubborn in the extreme. They bully around anyone who won't stand up to them. The Dassians (As they are known in the Kilb-iverse) are from the same sector of space as the Bajorns (Bajorans) and due in large part to the Dassians turning the Bajorns over to the Empire as an attempt to curry favor with the invading forces the Dassians and Bajorns have a racial hatred for one another. The Dassians have only just joined the Galactic senate and are considered to be as sneaky and underhanded as the Rodians or Fornigi (Ferengi...) when it comes to backroom deals, betraying those closest to them or interspecies contact.